Purple coneflower, Echinacea purpurea (L.) Moench, is one of the most widely used medicinal plants and dietary supplements in Europe and North America. All parts of the plant are suitable for manufacturing of the therapeutic extracts that are mainly applied for the stimulation of the immune system. Numerous attempts have been made to meet the increasing production demands of the commercially important plant biomass and to optimize the composition of pharmaceutical products, including plant breeding and various biotechnological approaches. It has been demonstrated that different types of stress applied in the flowering stage can change the amounts of secondary metabolites in E. purpurea root extracts substantially. However, nobody has so far tackled the question about changes in the amount of secondary metabolites and antioxidants in medicinal plant induced by the pre-sowing seed treatment. This study presents the first evidence that pre-sowing seed treatment with vacuum, CP, and EMF induces drastic increase in the amount of cichoric acid (relative amount in leaf extract increased 2.7-fold, amount per plant – 3.8-fold in EMF5 group), vitamin C (amount per plant increased up to 1.9-fold in EMF5 and EMF15 groups), and radical scavenging activity (up to 2.1-fold in EMF5 group) in E. purpurea leaves. In a newly published study researchers evaluated the effects of pre-sowing seed treatment by vacuum and radio frequency (RF) cold plasma (CP) on E. purpurea seed germination, seedling morphology, physiology, and on biochemical traits such as amounts of vitamin C, caffeic acid derivatives, and radical scavenging activity in young plant leaves. 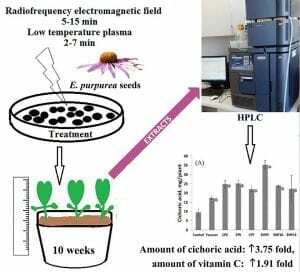 The researchers also tested electromagnetic field (EMF) treatment effects on E. purpurea germination and seedling performance, taking into consideration that potential of EMF for agro-technological applications is under extensive investigation. It was discovered that short seed treatment with vacuum, EMF, or CP can lead to substantial increase in the amount of the main secondary metabolite in the medicinal plant. Moreover, these effects were considerably stronger than effects observed on germination dynamics, morphological, and physiological parameters of plant development. The novel finding of this study is that short-time stress experienced by a seed may lead to drastic increase in amounts of plant secondary metabolites and improved antioxidant properties of leaf extracts. On the other side, these findings also open the possibility that seed stressors might be regarded as a potential tool for the controllable modulation of plant traits leading to the increase of commercially relevant medicinal plant production.